Don’t worry about the Android phone controlling too much of your life: It harbors no insidious intelligence, and the Robot Revolution is still years away. Until then, you can use your phone’s listening capabilities to enjoy a feature called Google Now. It’s not quite like having your own personal Jeeves, but it’s on its way. Finding the Google Now feature can be fun! On some phones, you drag your finger all the way up the touchscreen to summon it. 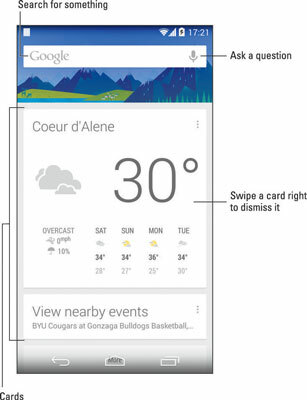 Other phones may feature the Google Now screen as the far left Home screen. Or you can summon Google Now by touching the Google Search widget on the Home screen. The figure illustrates a typical Google Now screen. Below the search text box, you’ll find cards. The variety and number of cards depend on how often you use Google Now. The more it learns about you, the more cards appear. You can use Google Now to search the Internet, just as you would use Google’s main web page. More interesting than that, you can ask Google Now questions. Google Now might also dwell in the apps drawer. It might be named Google Now or just Google. On some phones, you may have to touch a Get Google Now link to obtain the app.